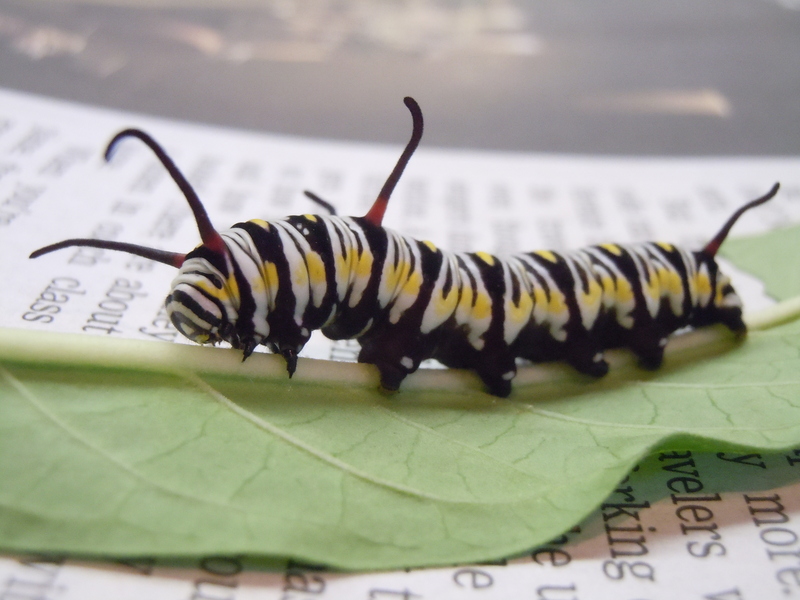 The debate on distinguishing Queen butterfly caterpillars from Monarch butterfly caterpillars continues in a slew of comments on the Monarch Watch Facebook page. I now stand double corrected: the antennae-like protuberances I mentioned in earlier posts as tentacles are in fact, not. Technically, they are known as filaments and are sensitive to sonic vibrations and touch. Thanks to Jim Lovett at Monarch Watch for clarifying the matter. What’s not clear is the purpose the filaments serve. Even scientists don’t fully understand the biological point of these amusing and kind of goofy extensions which seem to reach out and “feel” the universe around them. They swerve and turn in various directions, almost punctuating caterpillar moves like a roving eye or arched eyebrows on the human face. For more on filaments and what we do and don’t know about them, check this link on the Monarch Watch page. In the meantime, above is another photo of a Queen I took this week. The red coloration at the base of each filament is dramatic and surely must be a warning sign to predators: STOP! Don’t eat me!